Talib has admitted to loving every moment of his time in Tampa. He made plenty of headlines while playing for the Bucs, although, most of those headlines were not good ones. Talib’s Tampa troubles started early with an altercation between himself and former teammate Cory Boyd during the 2008 NFL Rookie Symposium. Following that incident were multiple arrests. His final mistake in Tampa came when he tested positive for Adderall. 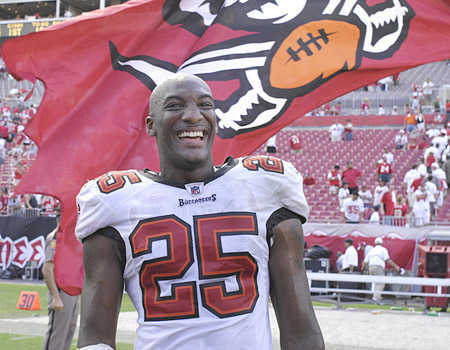 The Buccaneers and fans were fed up with Talib’s antics. Although he showed plenty of talent, that talent was equally shared with negative press and off-field behaviors. Many speculate that Talib’s return to Tampa will not quite be a warm one, but as it seems throughout social media, Buc fans miss the old knuckle head and coin him as one of the many fish that got away. Talib returns to Tampa, not with all the wrong doing in his mind, but all the good that came from playing in Tampa. He has made mention that he is no longer the wild and crazy kid that once plagued Bay Area streets, but is a matured man who has learned from his mistakes and ready to lay his past to rest. But hadn’t he just been shot at a nightclub earlier this year? From running wild in the Tampa streets and the adjoining area, to winning the Super Bowl, Talib has made himself quite the NFL career. Whether or not he is finished with that crazy lifestyle, he sure has made himself at home on Denver’s defense, where he is likely to remain. Previous articleJoe Hawley held out of Wednesday’s practice with ankle injury. Next articleRookies. Are you ready?